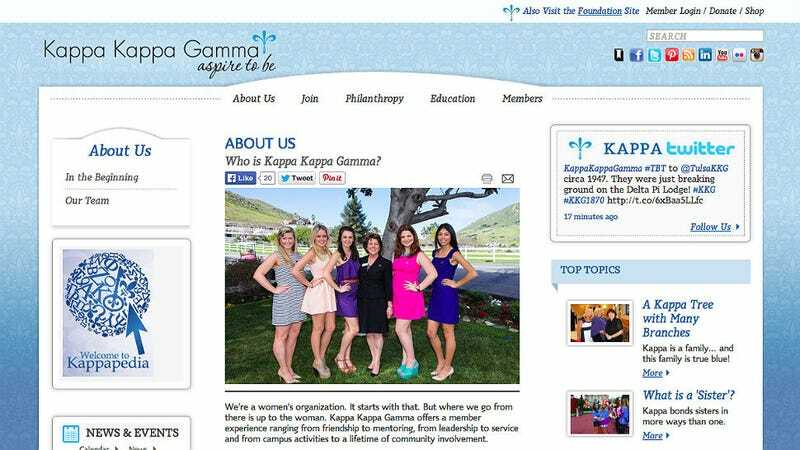 The Kappa Kappa Gamma sorority at University of Connecticut is no more, legally anyway. The school barred the organization’s registration and recognition after opening an investigation into their hazing practices and suspending the ladies back in March. According to the Courant, Kappa Kappa Gamma’s downfall began when a student named Hillary Holt (good name, btw, very Kappa) reported to school authorities that she’d been hazed by the Greek organization and told to "lay on the floor and sizzle like bacon and jump up and down and grab their ankles while pledging their love for their sorority, all while drinking beer and shots of alcohol.” It started off harmless enough, but Holt says afterward she was taken to another room and forced to drink until she blacked out. She awoke in the hospital. Meanwhile, UConn is expected to decide next week regarding the Sigma Alpha Epsilon fraternity which was also suspended and under investigation for hazing alongside Kappa Kappa Gamma. In addition, the fate of Delta Zeta sorority, who were banned from hosting or attending parties on campus after feeding frat bros dog treats last month, is also undecided. Kappa Kappa Gamma was barred immediately from acting as a student organization and they’re being forced out of their sorority house in “Husky Village.” Still, the sorority can appeal UConn’s decision in writing by May 14, 2014 but if they fail, they won't be able to re-apply as a student organization for four years.